Confessions of a Litwit: What to read? I realize it's been a while since I've written, dear readers, but unfortunately there's been quite a bit of life happening lately. I would live to say I've been reading, but alas... It is not so. "Why, Ms. Litwit! Why ever not?" The answer is in the chaos. An indie band named Rainier Maria (after the poet) have a great song called "Catastrophe Keeps Us Together," and I've been jamming to it a great deal. If you believe in God, or prayer, please send up a few for my family. I am about to start reading again. The last novel I read was a mystery called City of Glass by Paul Auster. Very thought provoking novel, but I need a work of fiction to get lost in...a world in which I might wrap myself. And not a series. I've quite enough of those I'm in the midst of. 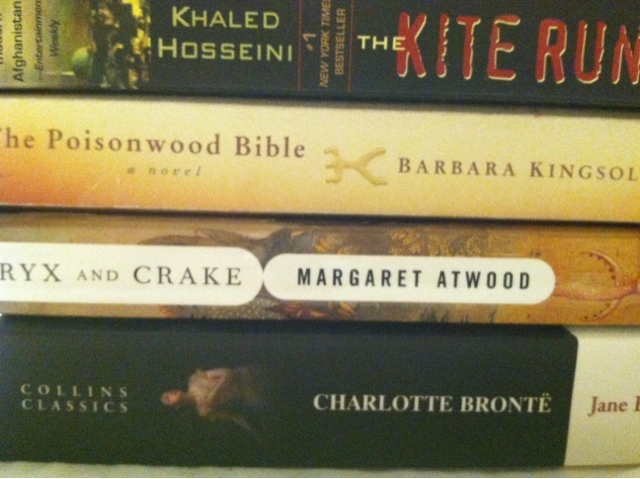 I'm thinking of either Jane Eyre (as I've never read it) or The Kite Runner or The Poisonwood Bible or Oryx and Crake.